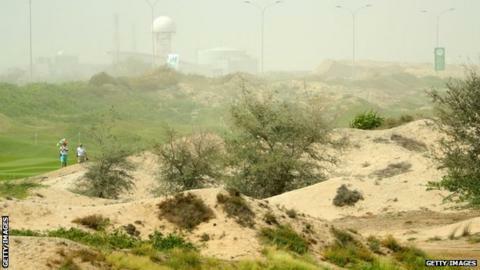 A sandstorm caused play to be suspended on day two of the Oman Open, with only 11 players finishing their rounds. Calm conditions early on Friday saw low scoring at the European Tour event but winds increased and carried sand across the course, limiting visibility. Play will resume at 07:40 local time (03:40 GMT) on Saturday with Denmark's Joachim Hansen and American Kurt Kitayama co-leaders on six under. European Tour commentator Jay Townsend said conditions were "extraordinary". As Hansen left his stance and walked away from his ball on a fairway because of sand blowing in his face, Townsend said: "He cannot see the green from where he is - this is amazing." Scotland's Scott Jamieson is a shot off the lead but has not started his second round - 130 players will need to conclude round two on Saturday.